Did you catch that? God has a tattoo. And it has your name on it. With full knowledge of what he was getting himself into, God made a decision to love us. That decision wasn't a temporary commitment—his love won't stop if someone better comes along. And it wasn't a conditional commitment—his love isn't based on what we can contribute to the relationship. It's a forever promise, a "not even death can part us" promise. In our human relationships, we long for tangible reminders that we're loved. We want people to remember our birthday, send us flowers for no particular reason, tell us what they appreciate about us, hug us. God knows we have this need. He understands our short memory and our desire for tangible proof. So not only does he tell us over and over in Scripture how much he loves us, he went so far as to engrave our names on the palms of his hands. If there ever was a doubt of his love, God's tattoo settles it now and forever. We belong to him. Permanently. Unconditionally. "It is he who made us, and we are his" (Psalm 100:3). Apparently we aren't the first ones who needed reminders of God's love. Thousands of years ago, God assured the Israelites of the coming Redeemer and of his plan to save them (Isaiah 49). But the Israelites weren't convinced. Though they'd seen God's faithfulness in the past, they were desperate for a little proof. They lamented, "The Lord has turned away and forgotten us." (Isaiah 49:14, CEV) None of these adjustments is so different from what everyone else goes through—it's just life. And maybe that's part of why change is so difficult to swallow. At the core of who we are, we long for permanence, for someone who'll never leave us, move away, get too busy for us, grow tired of us. Someone who'll never stop loving us. 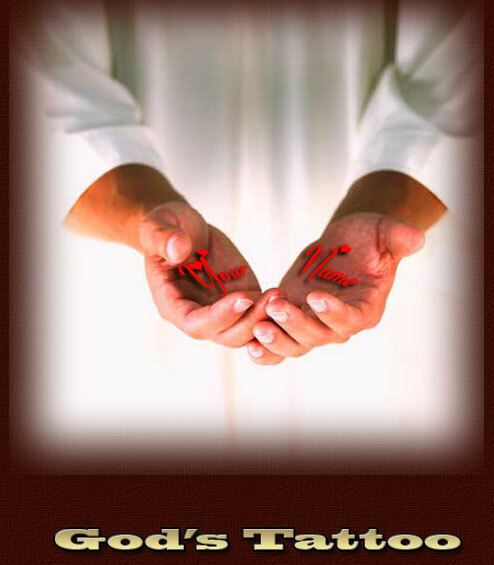 At the time the prophet Isaiah recorded the words "I have engraved you on the palms of my hands. "(about 2,500 years ago), it was common for pagan worshipers to carve the name of their god into their hands. The throbbing pain reminded them of their devotion and hopefully earned them their god's attention. God spoke into this mixed-up religious culture—and turned things completely upside down. Instead of asking us to prove our love and worship, he took great pain on himself to show us his love. And instead of demanding our sacrifice, he sent his Son to be the sacrifice in our place. "Christ … loved us and gave himself up for us as a fragrant offering and sacrifice to God" (Ephesians 5:2). Today it's common for people to get a tattoo with the name of the one they currently love on their body... then if they break up….. they often go through the painful, expensive, and not-guaranteed removal process. Or get another tattoo to cover it up. Thankfully, God's tattoo isn't like that. There's no chance of a removal process, no possibility of a cross-out. He'll never get tired of us; he'll never break off the relationship. He'll never abandon us or leave us for someone else. And he'll never ever stop loving us.